In June 2016, a Scottish Facebook site posted a couple of photographs of the gory remains of some strange animal sprawled on a beach. The post text read: "A dog walker out on the shores of Loch Ness has just stumbled across this. Has Nessy been found? Or someone playing a fascinating prank?" That original post was shared 1,468 times, spreading it far across the Internet. A thousand or more comments piled up below the post. Some people thought it was proof that the Loch Ness monster existed, some spent time and energy pointing out why it wasn't the Loch Ness monster, some got into arguments about the photographs, and lots of people came away from the discussion frustrated and even angry. Some doubtless still believe that the corpse of a mythical monster washed up on that Scottish beach. 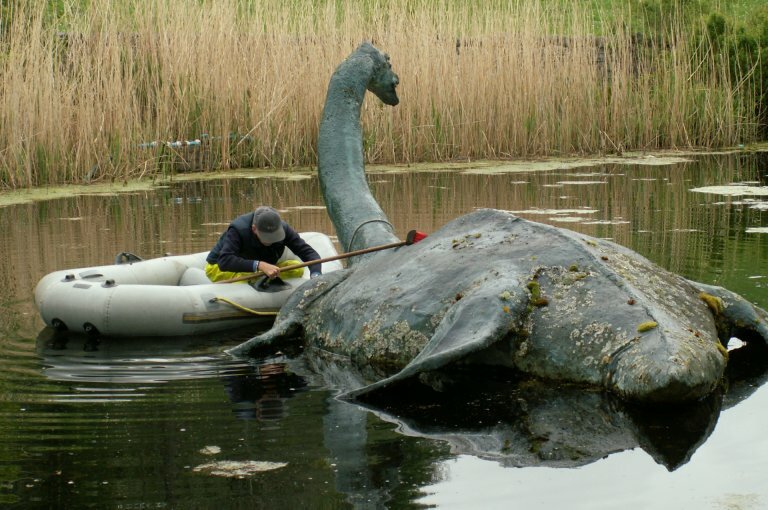 A model of Nessie, the Loch Ness monster, gets a scrub. This Nessie floats in a pond beside a Loch Ness hotel. It didn't. The tireless fact checkers at Snopes.com (a great place for hoax-busting) investigated and reported that the monster on the beach was created for a television program. In fact, the original poster admitted as much in the comment thread, but too late. Bad information - essentially, a lie - had already been spread. The Nessy-on-the-beach post wasn't made maliciously - but this kind of misinformation has consequences. People who want to believe in Nessy won't be deterred by the Snopes explanation or the decades of scientific research that have failed to find any evidence of monsters in Loch Ness. In fact, they're likely to think the photos and text are reasons not to trust science. And most of those people were almost certainly adults. Plenty of grown-ups have trouble separating fact from fancy, so imagine how hard it is for kids. They don't have years of experience and accumulated knowledge to help them sort it out. We at Sci/Why are very aware of how important it is to tell kids the truth, to give them facts, to provide information as accurate and understandable as we can make it. That's the information that will help them figure out, now and in the future, what is true and what is not. We not only think about getting it right. We write about it too - especially now, when the news is full of people debating issues of truth and lies. Here are links to some of our thoughts. Lindsey Carmichael, Sci/Why's favourite fox-fancier, is both a scientist and a science writer. Recently, on her own blog, she wrote a post - Where Do Facts Come From? - describing the lengthy process scientists go through to discover new information and tell the world about it. Several years earlier, Lindsey wrote another post - Reduce, Reuse, Recycle Does Not Apply to Research - this time on how science writers (rather than scientists) tackle getting the information right. 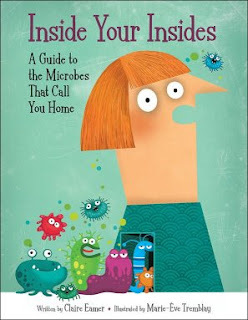 Our resident fungus-enthusiast, award-winning author Jan Thornhill wrote a post about how easy it is to absorb wrong information and how you can go about finding the truth - The Truth, the Internet, and the Number of Bacteria on Your Body. That bit of wrong information almost made it into my own book on the human microbiome - Inside Your Insides: A Guide to the Microbes That Call You Home. Fortunately, the article Jan refers to was published just as my book reached the final design stage, and I was able to sneak in a correction. Publishers don't like making changes that late in the process, but Kids Can Press didn't even quibble. Children's publishers care just as much as we do about getting it right for the kids. Finally, the alarmingly prolific Helaine Becker wrote a post - On Books - and "Real Books" - about how the "facts" you know might not be facts at all. And what to do about it. If you want to know whether a fact is truly a fact, just follow Helaine's example. And Lindsey's. And Jan's. Then we can all get it right, for the kids and for ourselves. Stories from the Stone Age fascinate many people. Who were the long-ago humans who made cave paintings and carved ivory? I've often wondered how they turned rocks like flint or obsidian into knives and tools. The things that scientists learn from a scrap of bone, or an old carving, are amazing! This year I got to put to use all my favourite archaeology facts while writing a book for Rosen Publishing, called The Paleolithic Revolution. It's part of a series called The First Humans and Early Civilizations. Here's an excerpt from the first chapter, with the heading "Effect of Activities on Bones." Bones are a lasting record of our lives. 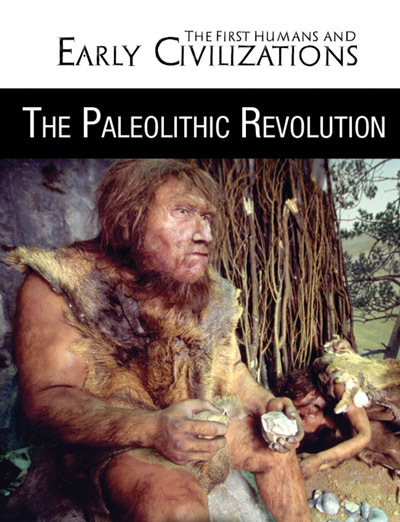 During the Paleolithic Revolution, modern humans were strong people. Their bones had much larger muscle attachments than is common today, even for professional athletes. Their bones were harder, too. Bones from people born today are on average 15 percent weaker than bones from people born during the Upper Paleolithic Era. This is due to two factors. People today are less physically active and use more kinds of tools. Physical strength is less important for survival. People then spent a lot of time walking, gathering food, and hunting. Leading active lives and using simple tools made their muscles and bones strong, just as it does for athletes and construction workers today. Paleolithic humans used their bodies as tools, putting stress and strain on their bones and joints. As people aged, their joints and backs wore out and became damaged. Bones broke from falls or fights, causing injuries like a rodeo rider would have today. Some breaks healed well, showing signs of good care. People broke their toes because their shoes were simple wraps or soft like moccasins, not rigid-sole boots. Their feet and toes were shaped from wearing sandals or soft skin shoes, instead of splaying wide from going barefoot all the time. Paleolithic people’s lives affected their teeth, too. From chewing tough food, their jaws grew a little bigger than people today who eat softer food. Bigger jaws meant fewer impacted wisdom teeth than today. Their teeth had fewer cavities than today, too, because they ate fewer grains and other food that sticks to the teeth. But they had other tooth problems instead. Since people used their teeth as pliers and clamps, their teeth got worn down, chipped, and even cracked. People also chewed leather to make it soft. Some old people had teeth worn down to nubs. The coral reefs of our planet are in danger. 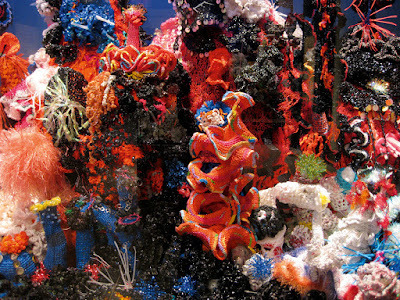 That's one reason a group of crafters are getting together to create artificial reefs - out of wool! Not only are they making something of extreme beauty, but their creation is bringing awareness of the reef's troubles to museum visitors. It's also helping to teach people about topology - the science of shape. 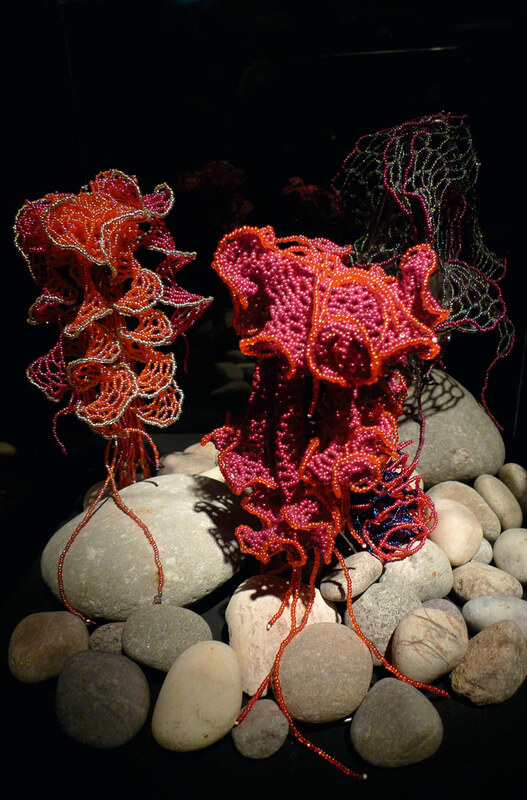 The Crochet the Reef project is a brainchild of two sisters, Margaret and Christine Wertheim, of the Institute For Figuring. 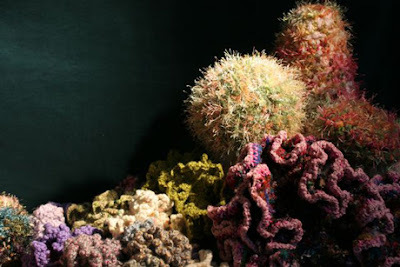 The inspiration for making crochet reef forms begins with the technique of "hyperbolic crochet" discovered in 1997 by Cornell University mathematician Dr. Daina Taimina. The Wertheim sisters elaborated upon it to develop a whole taxonomy of reef-life forms. The method for making these forms is a simple pattern or algorithm. On its own it it produces a mathematically pure shape. By varying this algorithm, however, the sisters discovered they could create endless variations and permutations of shape and form. One fascinating aspect of this project is how it addresses the dangers of a disappearing habitat with that of a disappearing craft. Traditionally, crocheting has been a feminine pastime and one sniffed at by men as being a less important technology than, say, IT. However, crocheting can not only produce many useful and beautiful materials, it can also be an excellent tool for exploring mathematical problems. 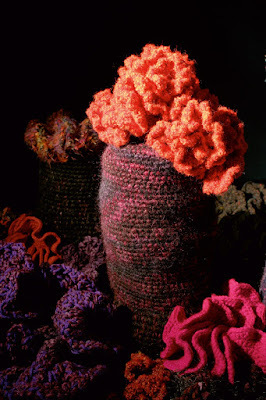 To see the crochet reef in person, you can visit the Museum of Art and Design in New York until January 22, 2017. Or check the Institute for Figuring website for other exhibit locations near you. This week, my new favourite science website is once again a NASA site. 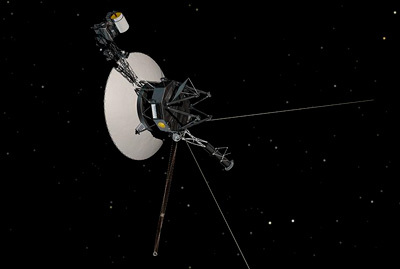 Their Deep Space Network keeps track of communications from interplanetary spacecraft, on missions around the solar system and beyond. And when you click on the link for their live feed, you can see representations of the signals being received right at that very moment by NASA's three big radio telescopes. When it comes to making a long-distance call, it's hard to top NASA's Deep Space Network. It’s the largest and most sensitive scientific telecommunications system in the world. This is an image borrowed from the Deep Space Network website -- thank you, NASA!